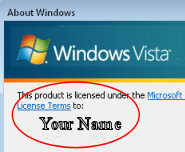 When you buy a machine with Vista pre-installed, sometimes OEM’s leave their name in your copy of Vista (or XP). A little research reveals that such names are stored in registry values called: RegisteredOwner and RegisteredOrganization. Here is a registry hack to edit the value to reflect your organization. As a bonus, I have an amusing story featuring Evans Twp and his experience of RegisteredOwner. To see what I am talking about call for ‘winver’. In Vista, click in the Start Search dialog box, and then type: winver. HKEY_LOCAL_MACHINE\Software\Microsoft\Windows NT\CurrentVersion\. Alternatively, in Regedit, click the Edit menu, Find, and then type: RegisteredOwner in the dialog box. Double click on the REG_SZ called RegisteredOwner. Change the value to a name of your choice. Repeat the above instructions for RegisteredOrganization. Exit Regedit and launch Start Search, type winver in the dialog box. Is RegisteredOwner a value in HKCU** or HKLM? Answer: neither, just type ‘Winver’ in Vista’s Start Search dialog box. In my homeland of Wales, Twp (pronounced Tupp) means a stupid person. The IT manager of a company I was working with was called Evans, and in common with many mangers, he was not very IT literate. Consequently, one of the techies, Dai ‘eighteen months’, nicknamed this manager: Evans Twp. (Dai lost part of an ear in a Rugby scrum, and as a result, he only had an ear and a half!). The IT department took on a new lad called Peter. Practical jokes are often part of the initiation ritual for new workers, and this company was no exception. Peter’s first job was to install five new Vista Machines. During the scripted set-up he discovered the Organization Menu; he stopped and asked Dai ‘eighteen months’ what he should enter. Dai said, "Put Evans Twp in the box". I was visiting the company doing other work, when I heard of Peter’s distress. Mr Evans told the poor lad that had to come in at the weekend and reinstall the machines, Mr Evans wanted the company name as the ‘Registered Owner’. I took Peter aside and showed him how to launch Regedit and find RegisteredOwner. We found Evans Twp and changed it to Mr Evans. Peter was thrilled as it only took a moment to make the registry hack, and Peter went to the rugby match instead of sacrificing his weekend to perform re-installs. 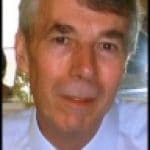 This page explains how to create, and then edit .reg files for your computer. As it’s easy to import the contents of a .reg file into the registry, do take extra care with procedures. Example RegisteredOwner .reg file.